I know, I know, another cookbook review, so soon after my last one! Considering my great love of cookbooks, you can imagine how thrilled I was to be given the chance to review another cookbook. Fresh and Easy Kosher Cooking is extra special to me, because it was written by the very talented Leah Schapira of Cook Kosher fame, someone I have gotten to know well since starting this blog. Her knowledge of flavors and foods never ceases to amaze me, and it definitely comes through in her cookbook. This book is not your mother’s old-fashioned kosher cookbook. This cookbook has eye catching recipes, international influences, and innovative recipes that you won’t find in the typical Kosher cookbook. The recipes in this book are simple and doable for the average housewife on a regular day, but still impressive enough for special occasions. Most importantly, this cookbook features ingredients that are simple and recognizable, not overly-exotic things that will make the reader run to Wikipedia. This cookbook doesn’t waste space! Where there is some extra page space, Leah includes helpful tips such as how to use a baking stone, the effect of beer on cooking meat, and the best way to store your prepared goodies for the freezer. Another thing I love about this cookbook is the way that most of the recipes have a “goes with feature,” where they list the name and page of recipes that go nicely with the one you are cooking. It’s menu planning made super simple, and it continues the overall easy-on-the-eyes and intuitive layout of the cookbook. Leah is known for her amazingly tasty and always creative sauces, and this cookbook definitely highlights this! There is an entire section of delicious dips and sauces, from basics like Chunky Hummus to the very same Pizza Dipping Sauce that Israeli pizza shops are renowned for. (Anyone who hasn’t heard of or tasted this sauce really needs to either get on a plane to Israel, or simply order the cookbook.) Additionally, there is an index at the end of the chapter with a list of other recipes in this cookbook that have dips and sauces. The index is laid out in a beautifully visual way, which makes it all so appealing! Onion Blossoms: hellooo favorite restaurant guilty pleasure. As soon as I get off my diet, I am making this! Pizza! That might sound simple, but Leah is a complete pizza pro, and has an entire chapter on this subject in her book. She includes a recipe for (what she says is) the best pizza crust in the world. Then she includes recipes such as thin crust pizza and calzones made from the pizza dough. Chicken Fajitas: this looks delicious and easy, and healthy enough. I love her suggestion of serving it in a laffa or pita, instead of the traditional wrap. Chocolate Babka: I have a soft spot for this dessert, and I’ve heard from many friends who made Leah’s Babka recipe that it’s the best they’ve ever had. Plus, Cook Kosher posted a video demonstrating the process, for hesitant beginners. This is an excellent all-around cookbook for any home cook looking for a wide variety of recipes for every occasion. Don’t let the Kosher label throw you off. There are only a few traditional Kosher recipes, and the rest are delicious recipes for anyone, whether or not they keep kosher. Overall, this is a great cookbook, but people with dietary limitations, such as gluten-free or sugar-free may find that they can’t make a lot of the recipes in this book. As I mentioned, I loved this cookbook. My only issue with it is that the recipes aren’t all that healthy, so when I am in serious dieting mode, a lot of the recipes won’t work for me. That being said, a lot of said unhealthy recipes can be easily adapted, by substituting whole-wheat flour for white flour, or sugar substitute for the real thing. This is a well thought out cookbook, with eye catching graphics and pictures. It features exciting recipes for both Kosher and non-Kosher readers, and uses basic and simple ingredients to create delicious meals. Leave a comment below telling me what your go-to, quick and simple supper is. 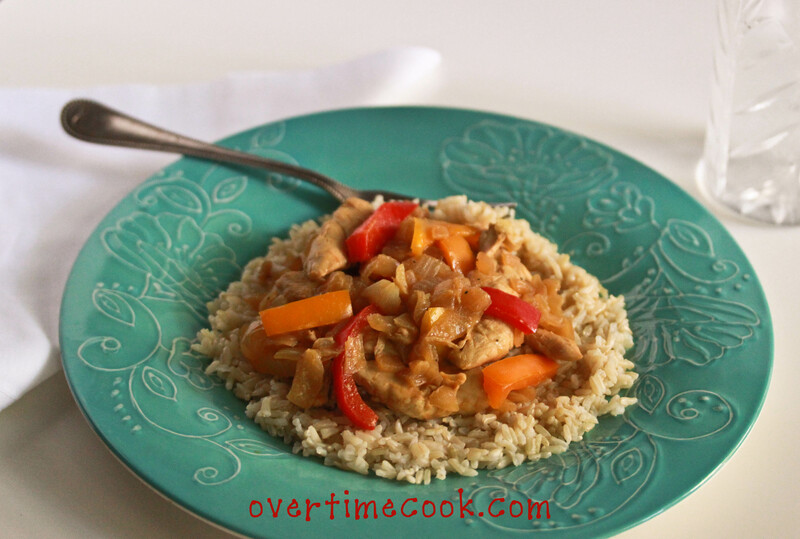 Follow @OvertimeCook on Twitter. Comment and tell me that you did so. 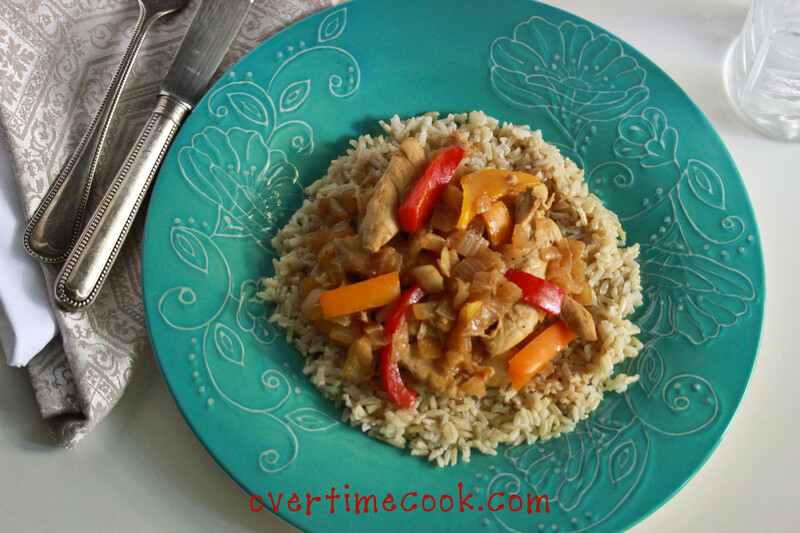 Like Overtime Cook on Facebook. Comment and tell me that you did so. 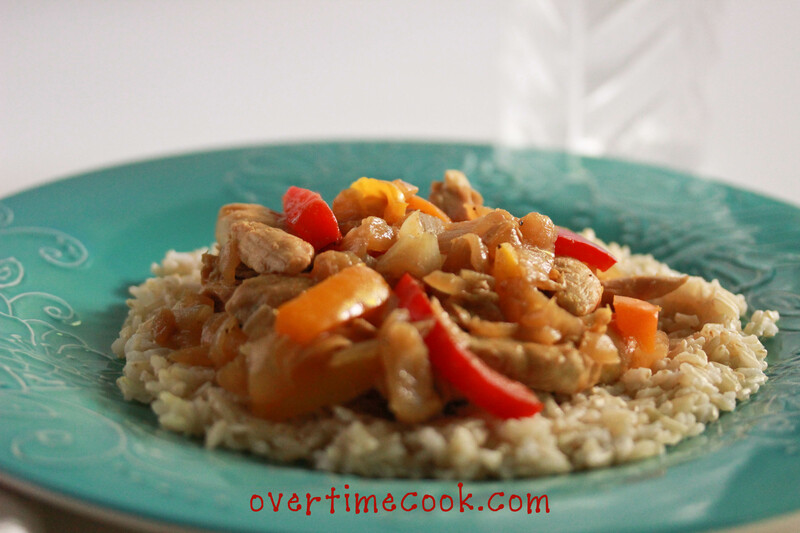 Follow Overtime Cook on Pinterest. Comment and tell me that you did so. Want unlimited entries to win a copy of this amazing cookbook? Well you’re in luck. Cook Kosher is giving away 2 copies to their members, all you have to do is post a recipe and leave a comment saying that you did so. Best of all- there are no limits to the number of entries there! Giveaway ends 12 am eastern time on Thursday, June 28th. This giveaway is open to residents of the US. Sponsored by Artscroll. Disclaimer: I was sent a copy of this cookbook to review. Opinions are my own. Cut the chicken into strips (about 2 inches) and season with salt and pepper. Set aside. Heat the oil in a large frying pan (or shallow pot) over medium heat. Add the onions and cook, stirring occasionally, for about 15 minutes, until onions are golden brown. Meanwhile, cut the vegetables into uniform strips. (*Note: these are the vegetables I used.You can use whatever you have on hand.) Once onions are golden brown, add the chicken strip and cook for about five minutes. Stir a couple of times to cook evenly. Add the vegetables. Add the honey, mustard and soy sauce to the pot, and stir to coat everything evenly. Cook for about 10-15 minutes, until the sauce is slightly reduced. My go-to dinner is breakfast for dinner…. either pancakes, waffles, or french toast. can u share the lemon chic recipe? My go to dinner is bourbon chicken and sweet potato fries. Yum! my go to dinner when i havent planned for anything and don’t want to think about what to make is 90% of the time: cast iron (makes all the difference) grilled chicken breast with brown rice and israeli salad. fast, simple, delicious! ranch chicken strips with rice/orzo pilaf & creamed spinach! Pizza. Thanks for the great review! Can’t wait to try some of the recipes you mentioned. I should be embarrassed to say but it is cereal and milk!! I guess I do need a cookbook! Whoops forgot the supper comment–it’s either breakfast for dinner (pancakes, french toast) or pasta with some sort of sauce. Can’t wait to try this recipe! My quick go-to supper is broiled chicken and couscous, with salad. Heaven! Btw about how many pieces of chicken breasts in 1 1/2 lbs? Awesome thanks! Making these for supper tonight…can’t wait! I’m not entering the contest. Just wanted to say that the chicken dish looks great and that you did another wonderful review of this book. My easy go-to dinner is scrambled eggs. Easy and I usually have all the ingredients on hand. followed on twitter! (already was) — wordpress doesn’t like me commenting so many times! cut up fruit for an easy summertime dinner! and lots of it! And now I’m following you on pinterest too. My go-to supper is grilled cheese :-). My easy go to dinner is whole wheat pasta with spinach, marinara sauce, and cheese! Hope to win this great cookbook! I followed you on Pinterest and Twitter and Facebook! My go-to dinner is pasta with a soy sauce-based dressing and chopped scallions and peanuts mixed in. Feel likes a “real” dinner but comes together very quickly. My go-to dinner is dijon mustard chicken cutlets, salad and brown rice. Following on Twitter, liked on facebook! Dijon chicken cutlets with brown rice and spring mix salad. Liked on facebook, followed on Twitter! My go to dinner would be a Portuguese omlette dish called tortas! It uses left over meat, veggies etc. Takes less than 10 mins to prep and makes use of leftovers so it’s great! Awesome post, and this cookbook is a MUST have!! The pizza, onion blossoms and babka that you mentioned are all incredible! Super easy, all the ingredients are most likely already in your pantry and don’t require any store hopping and they all taste incredible! Great post! Love your reviews, as if I didn’t already want to run out and by most cookbooks, after reading your last few posts, my wishlist just keep growing! Spaghetti or Lasagna are my go-to dishes, quick and easy! My go-to recipe is takeout. Just kidding. It’s probably a stir-fry with rice and beans. Both I and Cookie Comfort are following you on Twitter and Facebook, and i am following you on pinterest. Just saying. My go to dinner for myself is American Risotto (parboiled rice, tomato sauce and american cheese) and for my kids is sloppy joe pizza. @i_am_cookielady is following you on twitter. @cookiecomfort follows you on twitter. My go-to is usually quick noodles tossed with soy sauce and sesame oil, with steamed broccoli and tofu and whatever other vegetables I have on hand on top! Whole wheat pasta , grilled chicken, and steamed broccoli. It’s quick, and my kids love it with some butter and parmesan cheese! Chicken on the grill pan and baked veg. my go to dinner is beans, cheese, and salsa with shredded lettuce…easy and delish! My go-to summer supper recipe is couscous with diced cucumber and chickpeas, drizzled with a little olive oil and lemon juice. I love cereal and milk/yogurt/fruit/nuts/etc. but I guess if I am catering to others it would be pasta with some delicious (frozen) homemade sauce and whatever meat or fish is in the fridge. Meatballs and spaghetti. quick and easy! My to go dinner is definitly garlic bread and eggs! Quick and simple and all the kids in the family love it! beef stew in a crock pot with cous cous. Nothing like coming home to a dinner that’s already cooked! I follow you on twitter. I taste your recipes! George Foreman grilled chicken cutlets with israeli salad!! Super Quick!! My go to dinner recipe is schnitzel, israeli salad, and french fries. Easy! Hi! My dinner to go is caramelized duck sauce chicken! Cant wait to try Lea Shapira’s recipes! Good luck everyone! How many people do you think this chicken serves (as one of two mains for Friday night dinner)? Also, what additional vegetables would you recommend using? my go to dinner is veggie cheese omelets!